When looking for ways to improve your website, how do you decide which changes to make? And which changes to keep? This concise book shows you how to use Multiarmed Bandit algorithms to measure the real-world value of any modifications you make to your site. Author John Myles White shows you how this powerful class of algorithms can help you boost website traffic, convert visitors to customers, and increase many other measures of success. 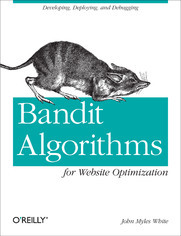 This is the first developer-focused book on bandit algorithms, which were previously described only in research papers. You’ll quickly learn the benefits of several simple algorithms—including the epsilon-Greedy, Softmax, and Upper Confidence Bound (UCB) algorithms—by working through code examples written in Python, which you can easily adapt for deployment on your own website. 2. Why Use Multiarmed Bandit Algorithms?